This is a great new project that just went live in the FSM Café on the University of California Berkeley campus. 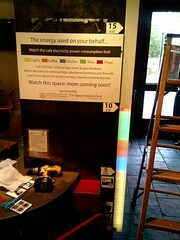 It's a floor-to-ceiling energy meter that displays a colorful stacked bar chart of power being used by various appliances within the cafe. It contains over 100 93 ShiftBrite RGB LED modules controlled by an Arduino. 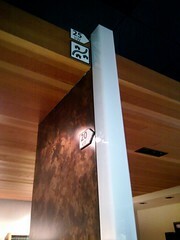 The bar in the cafe depicts the power used by different pieces of the cafe. Going from the bottom up, first you see the cafe lights in yellow, the kitchen equipment like refrigerators in blue, coffee machines in light brown, miscellaneous items like the drinking fountain in green, and the plugs used by laptops in the sitting area in red. Each segment is approximate 270 watts. The very top of the bar is at 25 kilowatts. That's the equivalent of power used by 30 average California homes. At the very bottom at the 0 kW mark you see a picture of a person and a biker. When the biker gets going up a hill, they can be generating as much as 200 watts, which is quite small when compared to the whole cafe, or even just the lights in the cafe. The icons depicting air conditioning and a toaster are also placed in relation to how much they use. If you look at the red portion of the bar. It's very small! That's the total power of all the laptops and the TV plugged in around you. People think it should be more, but it's not! 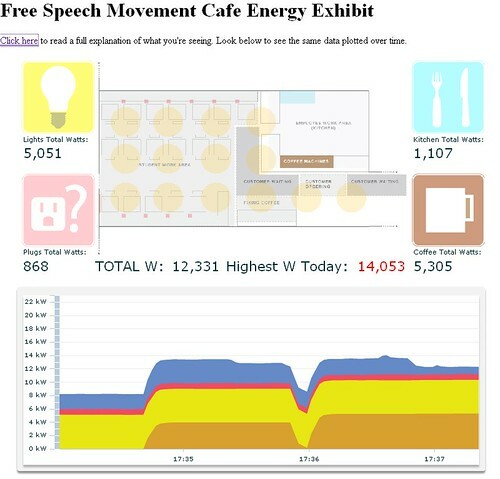 Can you see which portion of the cafe is using the most power? What would you expect it to be? As you sit in the cafe, glance back on occasion and see if usage has changed. Omar has promised me that they will eventually be able to post all the details of their project; files to laser-cut the mounting and diffusion plastic, Python scripts, Arduino code, details on the power sensors, etc. I'll add it to this post when it's available. We're very impressed with the project, it's a great example of a larger scale application of ShiftBrites. At maximum brightness on all LEDs, it shouldn't draw more than 40 watts, so it won't affect its own results too much. Submitted by Garrett on Sat, 02/06/2010 - 18:45. Submitted by Anonymous (not verified) on Sat, 02/06/2010 - 22:18. Submitted by A Bearz (not verified) on Wed, 02/10/2010 - 19:54. 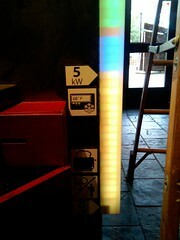 "Can you see which portion of the cafe is using the most power? What would you expect it to be?" I'd expect it to be the crazy homeless guy that lives under the table in the back corner with the spaceheater going fullblast. You know, the guy that's in the 14th year of his PhD in Political Science. Submitted by Andrew O'Malley (not verified) on Tue, 03/08/2011 - 07:42. Great project! Is a single Arduino connected to the Shiftbrites? I'm designing a project that plans to make use of 120 Shiftbrites -- aside from power issues, can a single Arduino (or single serial source) update all the Shiftbrites at a decent rate (25 times/sec or more), or would it be better to split them into groups (connected to separate Arduinos)?